Crown rot of wheat (Triticum aestivum), predominantly caused by the fungus Fusarium pseudograminearum, has become an increasingly important disease constraint in many winter cereal production regions in Australia. Our group has previously identified a range of quantitative trait loci (QTL) for partial resistance to crown rot in various bread wheat sources. Here, we report on work that has assessed the effectiveness of pyramiding QTL to improve resistance to crown rot. 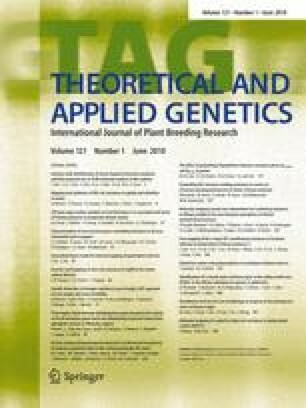 Two doubled haploid populations were analysed—one from a cross between two previously characterised sources of partial seedling resistance (2-49 and W21MMT70; n = 208) and one from a cross between 2-49 and the commercial variety Sunco, a source of adult field resistance (n = 134). Both populations were phenotyped for seedling resistance to crown rot. Microsatellite and DArT markers were used to construct whole genome linkage maps for use in composite interval mapping (CIM) to identify QTL. Three QTL were detected in both trials conducted on the 2-49/W21MMT70 population. These were located on chromosomes 1D (QCr.usq-1D.1), 3B (QCr.usq-3B.1) and 7A. QCr.usq-1D.1 and the previously undetected 7A QTL were inherited from 2-49. QCr.usq-3B.1, inherited from W21MMT70, was the most significant of the QTL, explaining up to 40.5% of the phenotypic variance. Three QTL were identified in multiple trials of the Sunco/2-49 population. These were located on chromosomes 1D (QCr.usq-1D.1), 2B (QCr.usq-2B.2) and 4B (QCr.usq-4B.1). Only QCr.usq-2B.2 was inherited from Sunco. QCr.usq-4B.1 was the most significant of these QTL, explaining up to 19.1% of the phenotypic variance. In the 2-49/W21MMT70 population, several DH lines performed significantly better than either parent, with the best recording an average disease severity rating of only 3.8% of that scored by the susceptible check cultivar Puseas. These lines represent a new level of seedling crown rot resistance in wheat. The authors would like to acknowledge Sally Coverdale, Maria Harris, Boyd McNamara and Tina Walters for assistance with phenotyping, and our USQ colleague Dr. Anke Lehmensiek for commenting on the manuscript. This research was funded by the Grains Research and Development Corporation, project USQ 00007.